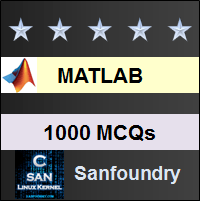 This set of MATLAB Multiple Choice Questions & Answers (MCQs) focuses on “The MATLAB Interface”. 1. Which functions help you to save and load variables? Explanation: There is a pre-defined function in MATLAB to store the variable values from your workspace permanently called ‘save filename’. Option d is the correct command syntax for calling it. Explanation: The only format for adding and storing comments in MATLAB is to use the % symbol. One can choose to end a comment using %, but it is not needed. Explanation: The echo command is used to display commands present in an M-file. If the M-file has any comments, the echo command will also display the comments. 4. Where do we need to store a function to call it in other programs? Explanation: M-files containing only a function has to be written separately and has to be stored as .m files in the bin folder. If it stored in any other folder, MATLAB won’t be able to access the function file. 5. What are the difference between the ‘help’ and the ‘look for’ command? Explanation: The ‘help’ command is used to return all the commands surrounding a particular toolbox name entered along with it. The ‘look for’ command is used to return a particular function or set of functions whose name matches with the keyword entered in along with the ‘look for’ command. 6. What will the following set of commands do when they are present in a script file? Explanation: The given format of the print statement is used to store the graphs of y1 and y2 generated due to previous definitions of y1 and y2. If we only use the print command, the graph y1 and y2 will get displayed. Explanation: The command close all is a pre-defined function in MATLAB. When it is called, MATLAB will automatically shut down the separate windows that have been opened to view graphs separately. The rest of the options are wrong. 8. What is not displayed by the Workspace? Explanation: By right clicking on the Workspace header, we will get to know the characteristics of the variables which are stored in the Workspace and what it can display. The time of variable generation is not present in the Workspace. It can only be seen if the variables from the workspace are saved separately using the command ‘save filename’. Explanation: Simulink is a separate package which is present in MATLAB. It helps to model and analyze a control system which makes MATLAB a very powerful tool for simulating dynamic systems. 10. How to stop the execution of a chain of commands? Explanation: It may so happen that we want to pause the execution of a set of commands at a certain point. We only need to press Ctrl and C together to pause it. On the other hand, quit causes the MATLAB software to shut down. Debugging modes are also available in MATLAB. 11. What are MEX files in MATLAB? Explanation: MEX files are one of the kinds of file modes available in MATLAB. They are saved with a .mex extension. These files help in the association of C source files into the programs written in MATLAB.